A key component to a successful business trip is an organized suitcase. When your suitcase is unorganized, you are more likely to forget to pack something or leave something behind in your hotel room. Seasoned business travelers have a system for packing their luggage and typically pack the same way for every trip. After years of traveling with only a carry-on, I have developed a tight system for packing my small Tumi suitcase. I use a combination of folding, rolling and packing cubes. I prefer to fold business clothes and roll clothing that won’t wrinkle easily like leggings and jeans. I also like to roll some of my clothes because I can fit them in a more compact area around my packing cubes. 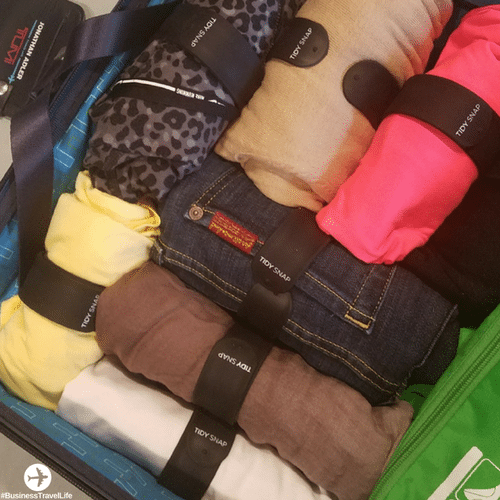 If you are wondering how to keep your luggage more organized, I highly recommend using Tidy Snaps to roll your clothes. Tidy Snaps remind me of slap bracelets (children of the 90’s, you know what I’m talking about here! ), only more durable. Tidy Snaps keep your clothes tightly rolled and organized in suitcases for the most efficient packing. Tidy Snaps are easy to use. Roll your article of clothing tightly and then wrap the Tidy Snap around it. 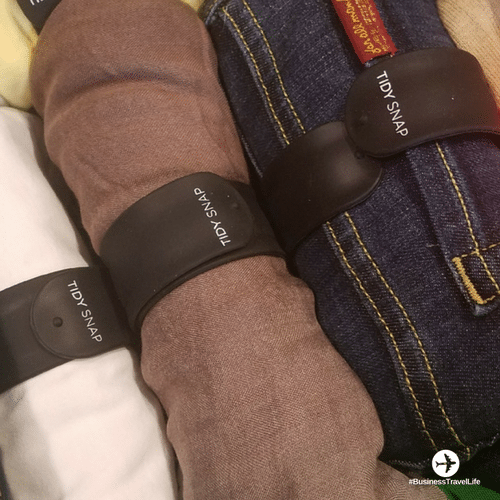 Tidy Snaps are spring steel bands that will automatically snap around your clothes. They are coated with a bonded silicone so even your most delicate fabrics will remain snag free. 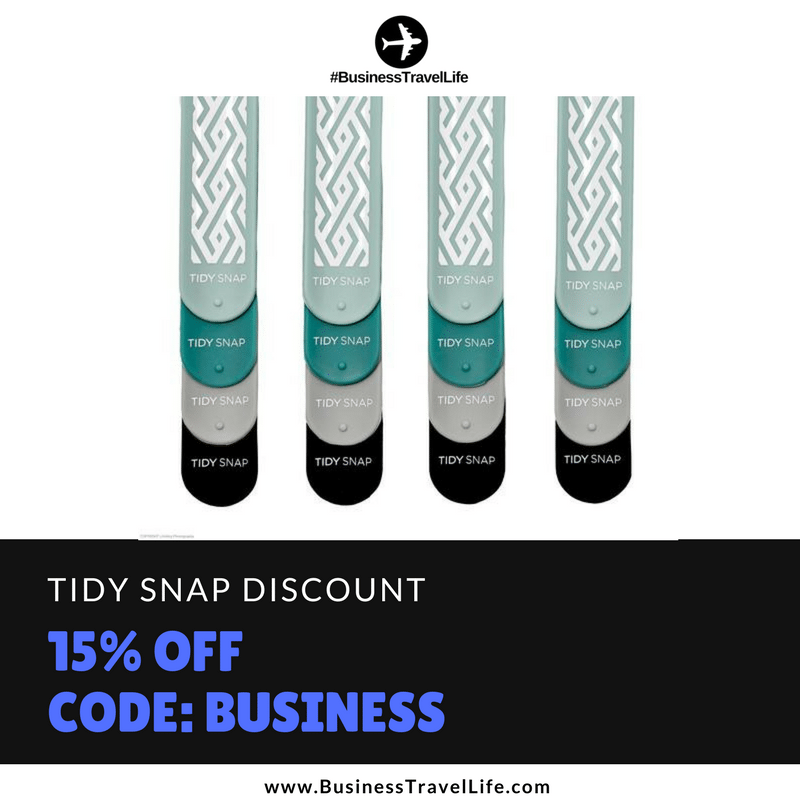 The large size Tidy Snaps (the size that most adults will need) are 11.8 inches long by 1.2 inches wide and come in four colors (black, grey, aqua and a pattern). You can purchase Tidy Snaps through the Tidy Snap website or on Amazon. They are sold in packs of 10 for $14.95 or 30 for $39.95 (on sale on the Tidy Snap website now for $13.95 and $37.95). 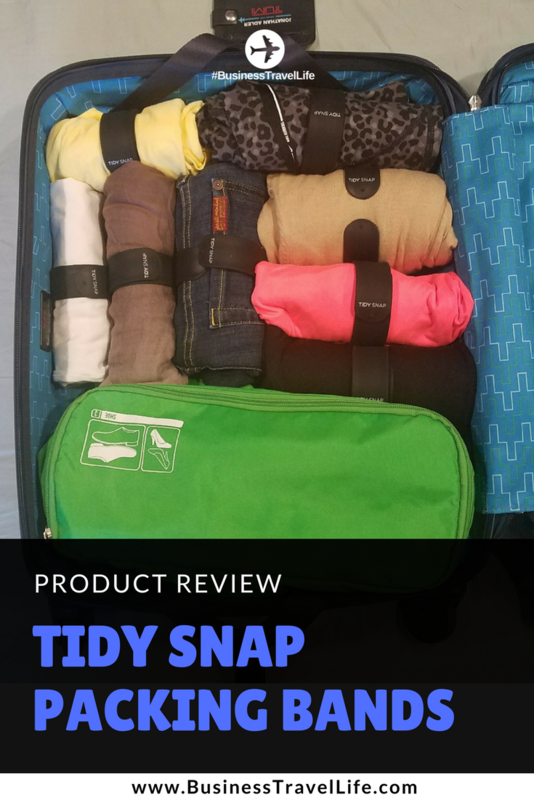 I was so impressed with Tidy Snaps, I may actually ditch my packing cubes and switch to rolling all of my clothes. I love how organized my clothes are in the Tidy Snaps. One of the downsides of rolling without a Tidy Snap is the rolls of clothing get loose as you unpack. With Tidy Snap, each roll stays tight whether it is packed in or by itself. As a part of our Tidy Snap review, I am thrilled to share we are giving away a pack of Tidy Snaps! Please enter to win a pack of Tidy Snaps below. You can use code BUSINESS to get 15% off your order on TidySnap.com. This post was sponsored by Tidy Snap. All opinions are my own. Very useful for business travel when everything must fit in a cabine lugagge !! Wow, these seem perfect, I love rolling my cloths but they always get loose. THE accessory to have for THE business woman always on the road, travelling from one location to the other, around the world.